Nestled in a most trendy area of Causeway Bay, this 400 square feet pop-up space well located near Times Square with high foot traffic, making it a perfect space for pop-up store, art opening, product launch and cocktail reception. 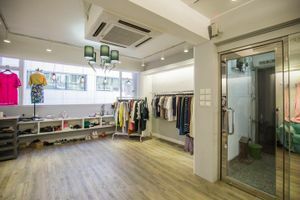 This space is located on the first floor of a residential building in Yiu Wa Street, which is near Russell Street, the most prosperous business area of Causeway Bay. This space is modern in style, with white color scheme, white wall, wooden floor, a big window allowing the maximum utilization of rays. In addition, it is equipped with lighting, counter, shelves and hangers which make this space a suitable space for retail industry. Also, air conditioning, storehouse, fridge and toilet are available for use. Moreover, with sound system, fitting room and a sofa, the whole experience can enhanced with a relaxing atmosphere.